Transportation services are offered to all residents of Harlan County, regardless of income or age. Language Assistance are provided at no cost. This transportation service is primarily for those in need of medical services, Department for the Blind, and Cumberland River Comprehensive Care Center. For a nominal fee based on the client’s specific need, transportation is provided so that citizens may have access to educational facilities, places of employment, shopping centers, agencies, and other sites. We currently cover the entire county as well as out of town medical facilities, airports, and bus stations. Harlan County CAA has an Intercity Feeder Service to Grey Hound Bus terminal located in London, Kentucky. Our schedule is three (3) days per week. The days are Monday, Wednesday, and Friday. Grey Hound’s schedule departure times are 9:45 a.m. going South to Knoxville, Tennessee and 1:45 p.m. going North to Cincinnait, Ohio. Harlan County CAA requires 72 hours notice to schedule transportation to the Grey Hound Terminal in London, Kentucky. Please call our toll free number 1-800-262-8594 Ext. 244. The rate for this trip is $25.00 one way. 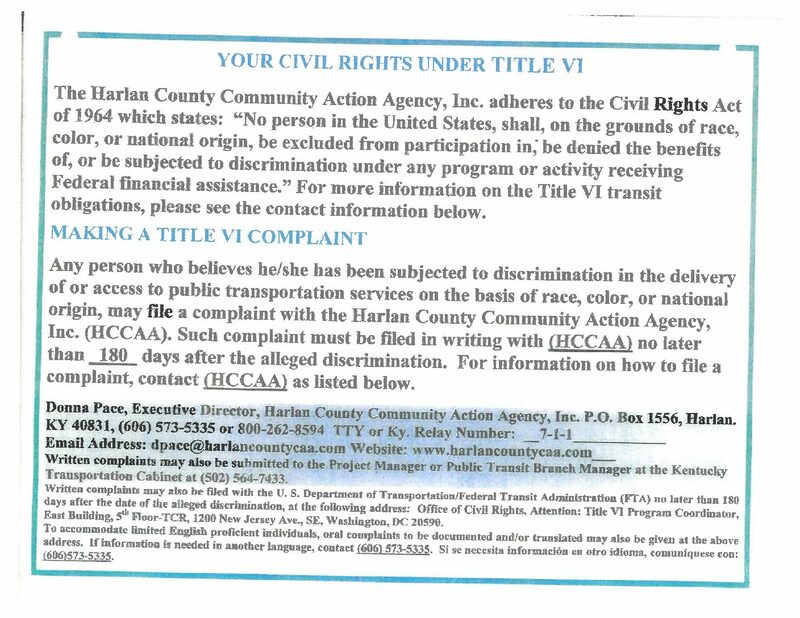 Click here for a copy of the Harlan County CAA Title VI Notice of Protection Against Discrimination. Click here for a copy of the Title VI Complaint Form. Click here for a copy of the Harlan County CAA Disadvantaged Business Enterprise Notice. Click here for a copy of the Harlan County CAA Limited English Proficiency Plan. Click here for a copy of the Harlan County CAA Americans with Disabilities Act (ADA) Reasonable Modifications/Accommodations Policy. Click here for a copy of the Harlan County CAA Americans with Disabilities Act (ADA) Reasonable Accommodations/Modification Request Form.